Hawkshead is an enchanting Lake District village with whitewashed cottages, narrow alleys and cobbled streets. It lies roughly halfway between Coniston Water and Windermere with Grizedale Forest and Esthwaite Water to the south. Between 1779 and 1786 William Wordsworth attended Hawkshead Grammar School. It was founded in 1585 by Edwin Sandys, Archbishop of York, as a charity school for local boys, but the by Wordsworth’s time had become an renowned educational establishment attracting pupils from all over North West England and beyond. The school closed in 1909 but is now open to the public as a museum. Visitors can wander around classroom and see the desk where Wordsworth carved his name, visit the headmaster’s study, and view the school’s original charter, signed by Queen Elizabeth I. The school is open daily between April and October and is located on Main Street, opposite the village car park. St Michael and All Angels church stands in a dominant position on a hill close to the school and offers good views of the village and surrounding fells. The site has been a place of Christian worship for over 800 years but the present building dates back to the 16th century. Interesting features include the church’s collection of 17th century Burial in Wool affidavits. In 1666, to protect the country’s woollen industry, the government decreed that all corpses, except those of plague victims, should be buried in woollen shrouds. It was a requirement that an affidavit be sworn, usually by a relative, confirming that the body had been buried in wool. The penalty for non-compliance was £5. Hawkshead has strong connections with Beatrix Potter. The offices on Main Street, once used by her solicitor husband William Heelis, have been transformed by the National Trust into the Beatrix Potter Gallery. The quaint 17th century building features an exhibition of her original drawings and watercolours and explores Potter’s life as a farmer, conservationist, and supporter of the National Trust. By 1905 Beatrix Potter had earned enough money from the sales of her first books to purchase her own property. Knowing the area around Hawkshead quite well, she purchased Hill Top, a 17th century farmhouse in Near Sawrey, on the eastern side of Esthwaite Water. She visited the house quite often but, with commitments in London, it was never more than an artistic retreat. In 1909 she bought the nearby Castle Farm and after getting married in 1913, lived there rather than Hill Top. After her death in 1943 Hill Top was left to the National Trust and is now open to the general public. In accordance with the terms of her will the property is preserved exactly as she left it. Potter’s death also saw the large Monk Coniston Estate pass to the National Trust. Situated just west of Hawkshead, it is home to Tarn Hows, one of the most picturesque spots in the Lake District. After walking round Tarn Hows visitors can also follow the 1½ mile track to Coniston Water and take the Coniston Launch to visit Brantwood and Coniston village. Grizedale Forest occupies much of the area south of Hawkshead and is managed by the Forestry Commission. It offers a wide range of facilities including the Go Ape assault course, cycle trails, a campsite, and a visitor centre with a café, shop, and children’s play area. The forest is also home to almost 100 unique outdoor sculptures. Hawkshead Croft is situated immediately east of Hawkshead and is the nearest campsite to the village. It accepts tents, touring caravans, and motorhomes. Static caravans can also be rented by the week. Facilities include a shower and toilet block, electric hook-ups, laundry and washing rooms, reception and shop, and a games room with TV and pool table. Hawkshead Croft also has some flats in the village available for short term holiday rentals. Hawkshead Hall is less than ½ mile north of the village and caters to tents and a limited number of touring caravans. The family-orientated site offers a toilet and shower block, and utility room for washing dishes. A milkman visits the site each day selling milk, juice, and other basic provisions. Other sites in the area include Bowkerstead Farm Grizedale Camp Site and Riding Centre in Grizedale Forest and the National Trust’s site at Low Wray, on the western shore of Windermere. Cars and other motorised vehicles are not permitted to enter the centre of Hawkshead. There’s a large car pay-and-display car park at the southern end of the village. It’s run by the Lake District National Park Authority and is almost half the size of the village itself. There are public toilets here plus a few shops selling outdoor clothing, souvenirs, postcards etc. The car park is situated just off the B5285/6. Drivers with satellite navigation systems can use the postcode LA22 ONT. Drivers coming to Hawkshead from Bowness can take the Windermere Ferry across the lake. After the short trip from Ferry Nab (near Bowness) to Ferry House on the western side of the lake, Hawkshead is just 3½ miles down the B5285. The alternative is to drive all the way around the lake via Ambleside, a 10-mile journey. Once waiting times for the ferry are factored in, any time savings made by taking the ferry are negligible. However, the ferry is a pleasant way to travel and the B5285 passes Hill Top and Esthwaite Water before reaching Hawkshead. Bus service 505 (The Coniston Rambler) travels between Windermere train station and Coniston village. Stops on the way include the Lake District Visitor Centre at Brockhole, the Waterhead (for Windermere Lake Cruises), Ambleside, and the Waterhead Hotel (for Coniston Launch. The Cross Lakes Experience that allows visitors to plan their own trip around Bowness, Hawkshead, and Coniston using several different modes of transport. For example the trip from Bowness to Hawkshead would involve taking the Windermere Lakes Cruises ferry from Bowness on the eastern side of Windermere to Ferry House on the western shore, and then taking a Mountain Goat minibus to Hawkshead. Passengers wishing to travel onwards from Hawkshead could catch a Stagecoach bus to Coniston Water, and then take the Coniston Launch to Coniston village. There is no train station in Hawkshead. The nearest station is in Windermere. Catch bus 505 to travel between Windermere train station and Hawkshead. 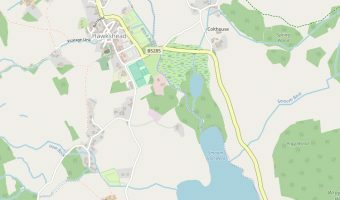 Map of Hawkshead and the surrounding area.